A Rolls-Royce was best sampled from the rear seat, that's a belief I lived with for the longest time. A limousine of its stature being driven by its owner raises enough eyebrows, does it not? If someone could afford to spend a princely sum for a Rolls-Royce Phantom, a driver for it would be a negligible cost. So when a Ghost pulled up outside the Nice Cote d'Azur airport with Adolf behind the wheel to pick me up I continued to profess faith in the idea that a Rolls-Royce big or small was best experienced perched on that ample gorgeously leathered rear seat. Interestingly Rolls-Royce themselves don't share the same belief. According to their surveys most of their owners are also people who prefer driving themselves. Probably not everyday but definitely on a regular basis. And so I was handed the keys to the new Phantom II at the lobby of the very exclusive Cap Estel hotel. 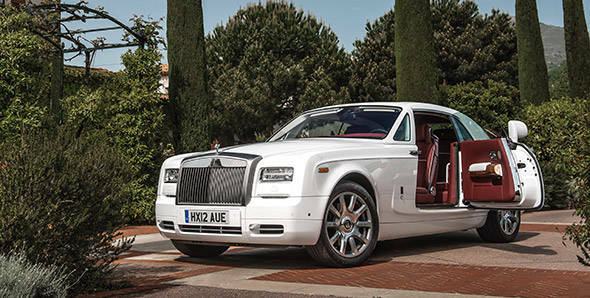 This new Phantom is still very much one of the most recognised grilles on the planet but a new age of buyers has inspired Rolls Royce to bring the Phantom up to date. The key I have been handed unlocks a three-door Phantom Coupe, which in abject size terms has exactly the same dimensions as the five-door limousine. Er, the doors are longer, and it opens up in the suicide fashion, so unless you have an arm the size of Africa there is no way you can reach out from your seat and shut the door. Suddenly the 'CLOSE' buttons at the base of the A-pillar seems such a sensible touch! It's one of the traditional items that stays just where it is and the way it is. There are other things in the new Phantom however that are not so immovable. From the outside it's things like the new rectilinear LED headlights that possesses a slimmer outline than before but is still regally positioned up high. The oval xenon driving lamps are no longer there, in hindsight they did look a bit odd and out of place and the bumper and the area immediately under the head lamp is remodeled to look busy in an elegant fashion. Apparently Rolls Royce owners are also very discerning and have a very strong eye for details, which is why the new grille is made from a single piece of stainless steel rather than the three it took in the older car. The oligarchs, dictators, generals and directors who can afford these cars wanted a Michelangelo like hewn from a single block of metal work of art, not a machine tooled component! The one grouse I have with these subtle change is that the new Phantom now closely resembles the Ghost rather than the Ghost mimicking its older sibling! Having said that I'd also add that the Phantom II in no way loses its regality, imposing character and elegance. The Phantom still occupies real estate large enough to build three towers, a swimming pool and a small jogging park, in South Mumbai! There are other changes too but they are so subtle and so few that it took a few minutes for those to be pointed out. These are and it really won't take you long to read this, the RR badge and indicator on the fender are one piece, the rear bumper is remodeled slightly, the glass on the C-pillar has been improved and there are a few more alloy wheel choices actually just three new wheel finishes to choose from. Now if you aren't rich, rich as in RICH, you probably won't understand why is it that just three or four new cosmetic additions to a car that hasn't changed in nearly a decade are so important? So to understand that you have to go back in time, to the founding philosophies of Sir Henry Royce, one half of the Rolls-Royce company. According to Sir Royce, the car company he founded made the best cars in the world and that philosophy has stayed that way. Now if you were the best you really have no need to change do you? That is why Rolls-Royce firmly claim to have updated this car and not changed it. It's a clever stance to maintain, and any revision does not rubbish the best in the world claim and yet leaves enough room for modernisation. There is another way to look at this too. The original design of the Phantom crafted and released in 2003 was timeless. Even today without having to make any drastic cuts the design is still fresh, inviting and contemporary. So change just for the sake of change is still not necessary and Rolls-Royce customers evidently like it that way. Inside the new Phantom subtle updates have been applied to the dashboard, the LCD screen for the multi information display for instance is now larger. The navigation systems have been updated which means you get the new BMW iDrive system, audio and mobile connectivity has improved and the controller knob of the Ghost that is a more functional unit thanks to the shortcut keys has been incorporated in the Phantom. The Phantom however is not a Rolls-Royce because it has the finest entrapments. A Rolls-Royce above all is known for it's engineering, its engine which at idle can't be heard over the sound of the clock in the cabin or even felt for that matter is its testimonial. It's a marvelous piece of work and it's now complemented by a new eight-speed automatic gearbox sourced from parent company BMW. Those eight ratios improve the Phantom's performance, efficiency and sublimity. It is truly amazing to drive a car whose football field sized hood shields an engine powerful enough to provoke the next continental drift with such serenity. In all my years as a journalist I have never ever felt this sense of calm while driving a car. Of course the narrow roads lining the Cote d'Azure find it a challenge to accommodate a car this big, so you really can't bring your racing gloves and thin soled shoes to this party. But that has little to do with the way this car accelerates, its linearity and smoothness is only contrasted by the numbers it punches out. At full bore acceleration it does 100kmph in just 5.8 seconds and I'm willing to bet even her Majesty at her age wouldn't feel the jolt. The new transmission makes the Phantom even more sublime, but what truly amazes me is that it has no manual mode so no paddles behind the steering wheel or a stick with a small plus minus typeface that allows the driver to change gears. And yet this engine is incredibly sensitive to gear changes, knowing instantly which gear is required. The Phantom Coupe I drove is of course more driver oriented than the stately limousine even though the entire family gets enhancements to its aluminum space frame. It's got the firmer suspension, is 20kg lighter and has a longer wheelbase with shorter overhangs. The acceleration time I mentioned before belongs to the coupe and it's a second quicker than the limousine. Of the entire Phantom family it is the best example to drive, and lots of fun too soon as you understand just how much room you need to play with. Yet calling this a driver's car is far from the truth, the Phantom Coupe is certainly a car you can drive joyously but even after the moderately long drive past the stunning Riviera I wrapped up feeling a bit exhausted and I don't suppose a Rolls-Royce is supposed to do that to you. The only reason I can pin this down to is focusing ever harder on maneuvering the car through those narrow roads. That is why I'd prefer being driven around in something this stately. In fact later that night after dinner at the Philippe Starck designed A'Trego restaurant at Monaco harbor, I got driven around Monte Carlo in the Phantom. As we rolled in towards the casino complex we had to slow down for a minute. That was enough invitation for the people who throng the pavements to whip out their cameras in the hope of capturing a photograph of someone celebrated. For those fleeting moments I did feel awkward and yet special, it was the perfect moment, the perfect setting, the perfect location and even the perfect car. All that remained was stopping the car, opening the door and stepping out... if I wanted to break the spell! Instead I kept mum, let the Phantom roll past and kept the magic alive!